Presentations were given by key stakeholders from different health and research organisations as well as from private companies and included topics such as sustainable business models, health technology assessment, ethical and product liability issues as well as the EU Medical Device Directive. External stakeholders had opportunity to meet in a workshop setting to exchange views, opinions and visions for future developments in the healthcare domain. The various presentations spurred very lively discussions among the participants. The feedback was predominantly favourable, with a high percentage of questionnaires returned and the majority of ratings in the Good/Very good categories. About seventy percent of the audience thought that telemedicine would be instrumental in reducing healthcare costs in the future. 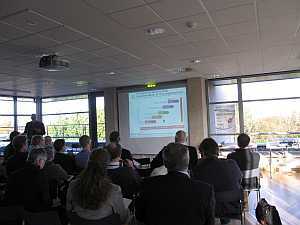 After the workshop several of the applications developed in the REACTION project were demonstrated.